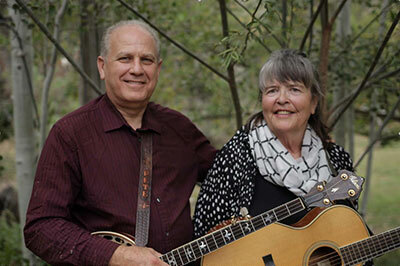 Pete Wernick, known for his banjo playing with Hot Rize, and his singer-guitarist wife Joan present one of the West's most engaging country duets. Joan's clear, soulful singing and Pete's masterful picking bring life to a diverse repertoire including traditional bluegrass, vocal duets and blazing instrumentals. In the early 70s the pair performed with the groundbreaking progressive bluegrass band Country Cooking, based in Ithaca, New York. Since 1976 they have lived in Niwot, Colorado in the foothills of the Rocky Mountains. Since 1990 they have performed all over the continental US as well as England, Ireland, Russia, Hawaii, Israel, Holland, and recently on national TV in Denmark. They also work together in presenting Pete's Bluegrass Camps at locations around the US. Pete's "Dr. Banjo" handle is based both on his banjo expertise and his Ph.D. in Sociology from Columbia University. He has been nominated for Banjo Player of the Year in national polls and is also known for his best-selling instruction videos and books, and his banjo and bluegrass camps since 1980. For 12 years he toured full-time with the much-lauded Hot Rize band, and continues to play a limited schedule with the long-lasting quartet and with his Flexigrass band which also features Joan's vocals. Pete's critically acclaimed solo album, "On a Roll", received several award nominations and produced a #1 song, "Ruthie". of Dr. and Nurse Banjo. Selected track from "Windy Mountain"
Joan, also known to music fans as "Nondi", has sung with various groups in Colorado and hosted a bluegrass radio show on KGNU Boulder since 1978. Her natural sparkle and the couple's on-stage repartee adds an extra dimension to their duet performances. Bluegrass Now magazine said, "Joan's singing is guaranteed to bring a smile to the face of any bluegrass traditionalist."